We are aware that learning new technologies and methodologies requires excellent knowledge transfer. 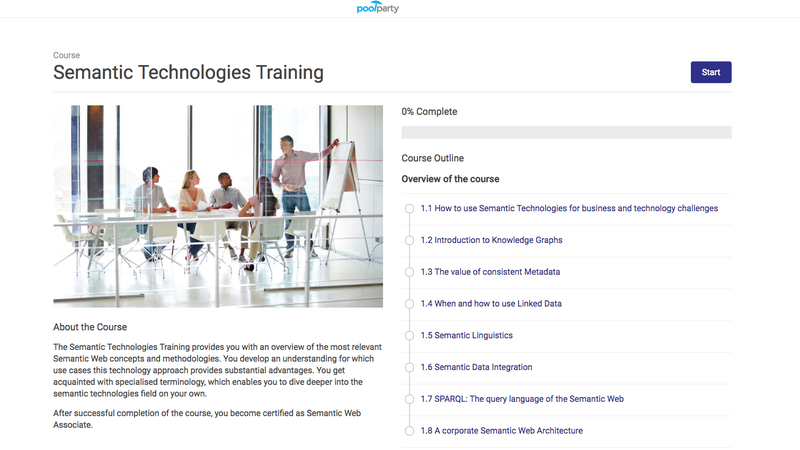 PoolParty Academy offers three E-Learning tracks that enable customers, partners and individual professionals to learn Semantic Web technologies and PoolParty Semantic Suite in particular. After successful completion of the course, you will be able to adopt Semantic Web technologies for your daily work. The certification proves your skills and expertise in the arising field of cognitive computing. Training fees & availability This online training is free for all interested parties. * Participants have access to the E-Learning platform for 1 month. This certification program costs 800 EUR (900 USD). *This training includes the Semantic Web track. ** Participants have access to the E-Learning platform for 3 months. ***Customers with a maintenance contract have this training included in their on-boarding. This certification program costs 1.200 EUR (1,300 USD). * This training includes the Semantic Web &Knowledge Engineering Track. ** Participants have access to the platform for 3 months. ***Customers with a maintenance contract have this training included in their on-boarding. The Semantic Web Training covers Semantic Web methods and technologies in general. 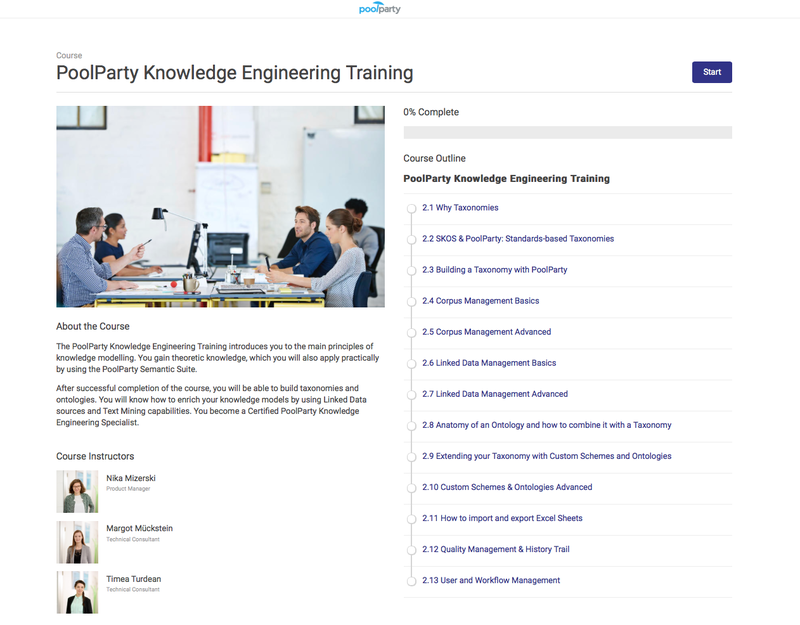 The PoolParty Knowledge Engineering Training covers all functionalities of the PoolParty Semantic Suite. The PoolParty Semantic Integration Training enables developers to work with PoolParty API’s and integrate the semantic middleware with third-party systems. You will know all relevant Semantic Web methodologies and concepts. You will be able to relate business challenges with semantic technology solutions. You will have a specialised technical vocabulary that enables you to communicate with Semantic Web experts and benefit from their solution approaches. You will apply your Semantic Web knowledge and work productively with PoolParty Semantic Suite. You will be able to build knowledge models and use advanced functionalities as Linked Data Management and Text mining to accelerate the modelling process. You will gain the practical skills to integrate the PoolParty semantic middleware. You will know how to enhance IT architectures with an innovative metadata management solution. * By clicking SEND I agree that I have read and accepted SWC Privacy Statement and the Terms and Conditions. Certified PoolParty partners know the product inside and out. They are perceived as trusted consultants and integration experts within the market. The Semantic Web Company are more include to recommend certified PoolParty partners. Training Goal: Certified PoolParty Partners have proven their capability to use the PoolParty Semantic Suite to the customer’s benefit. They can adopt technology solutions to individual application scenarios. 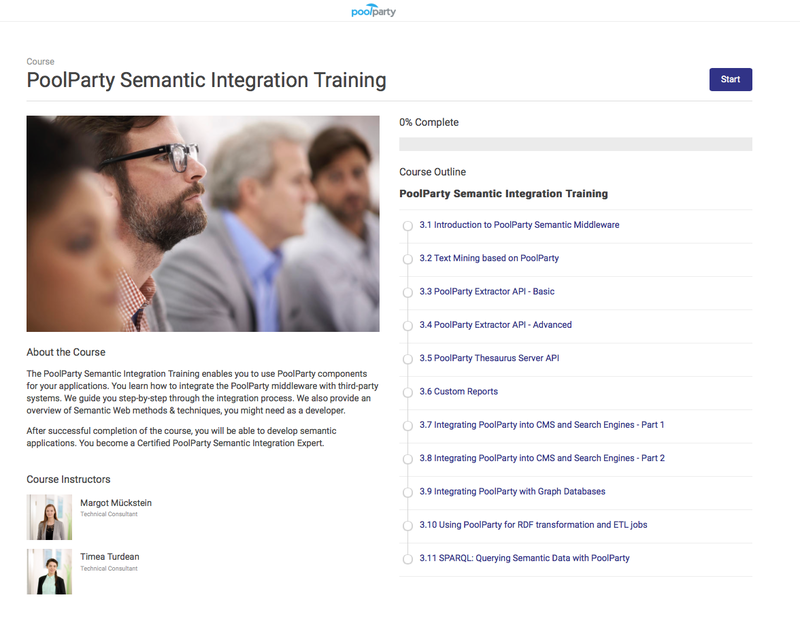 Universities interested in using PoolParty Semantic Suite for courses, can apply for our academic partner program. Let your students gain practical experience with an industry-relevant Semantic Suite. The academic partner program grants seats for the E-Learning program and the PoolParty Semantic Suite. Terms & conditions to join the program will be discussed on an individual basis. Which benefits do I have when I get certified? It takes some effort to learn new technologies. The certification program includes video tutorials, exams for revision purposes and applied tasks. That way, you really learn how to adopt semantic technologies in your work. The certification is also a quality assurance to employers and business partners who are looking for Semantic Web experts. What happens after I send you the registration form / purchase order? You will get a welcome mail for our E-Learning platform with further instructions. Attendees of the Semantic Technologies Training will get access to the platform for 1 month. Attendees of the Knowledge Engineering and Semantic Integrations Training will get access for 3 months. When you successfully completed the training, you will obtain a certificate. What can I do when I encounter troubles during my registration process or during the training itself? Please send your inquiry to: academy@poolparty.biz. We are eager to help. How can I look up PoolParty tutorials, when I am not attending the academy anymore? Our help portal includes many resources that enable you to deepen your knowledge about PoolParty. Where can I login to the PoolParty Academy?